Being an adventurous young student who wants to travel and explore different places across the globe, is difficult when your bank balance is as holey as my own. I am a student and own a horse so, unsurprisingly, my funds are limited. Subsequently, I have decided that rather than going aboard and spending a lot of my university funds, I will instead explore the British Isles. This, admittedly is not for everyone. However, the long scenic drives, discovering beautiful places, and the chance to follow my nose really suits me. During the Easter holidays, I drove to the small Welsh village of Bala with my partner. Y Bala, Welsh for “Bala”, is a small historical village located in Snowdonia National Park. It is about an hour’s drive from my home in North Wales: a lovely scenic route with winding roads and sloping mountains which surround you as you drive. I decided to explore the village of Bala, before Bala Lake (Llyn Tegid) and the Penllyn mountain ranges, Aran, Arenig and Berwyn. The village is very small. There is a high street which runs through the centre, and tiny side roads breaking away from this. The high street is lined with local shops, pubs, restaurants, a hotel and some quaint bed and breakfast establishments. Bala has a vibrant and lively atmosphere, and Welsh is spoken by many of the residents. It is worth knowing some key Welsh sentences, such as “bore da” (good morning), “p’nawn da” (good afternoon) and “diolch” (thank you). We stopped in at the White Lion Royal Hotel for a quick bite to eat and some drinks. After feeling a bit stuffed and learning about different activities and sights to see in Bala from the staff at the hotel, we decided to have a closer look at the lake. 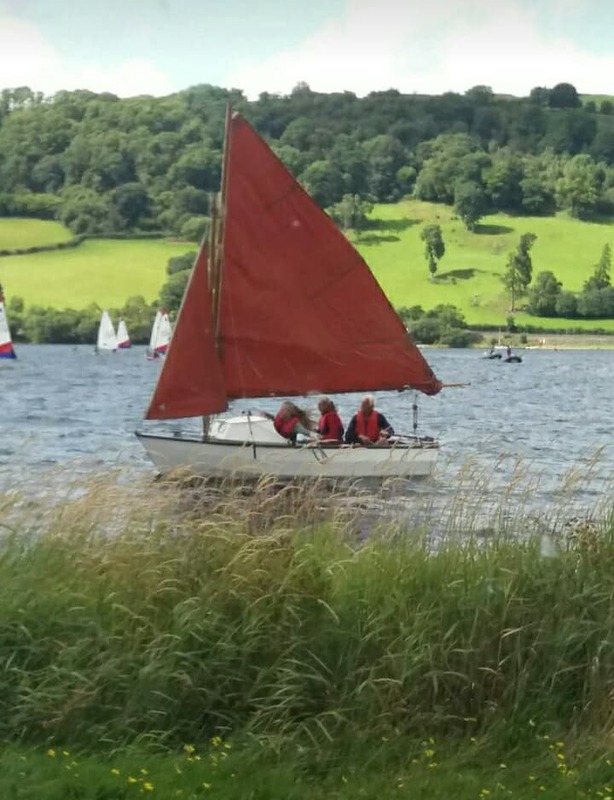 There are many places to park around the lake and walk down to the water’s edge, but we decided to go to the East side of the lake to the Bala Sailing Club, which is a bit quieter than the Western side. We drove down a pebbled lane and parked the car beside the lake. The Tryweryn and Dee rivers flow either side of Bala, creating the lake and beautiful scenery and waters. Bala Lake is the largest natural lake in Wales. It is over four miles long, a mile-wide at its widest point, and is an important home to the surrounding wildlife. Bala Lake is the only place where you’ll find “Gwyniad” fish, a species that was trapped in the lake at the end of the last Ice Age. The Tryweryn river is also world-renowned for its white-water rafting opportunities, for beginners and world professionals alike, who are all welcome at the National Whitewater Centre. The lake is also freezing. Visitors in expensive and warm wetsuits are considered brave. So, when my partner and I decided to jump off the jetty, into the lake in just shorts and a bikini, you can imagine the shock to our bodies. However, after a lot of expletives and frantic swimming, we quickly adjusted to the water’s temperature and it ended up being a thrilling and worthwhile experience. We then heard that there was an old railway station just across the road from Bala Sailing Club. The train ticket was a reasonable price, so we got a return journey which took us down the East side of the lake to the river estuary. The train ride was about four miles one way and the scenery worth the trip. Overall, I found Bala to be a beautiful and serene place to visit with exciting and thrilling activities for those who want the adrenaline kick.